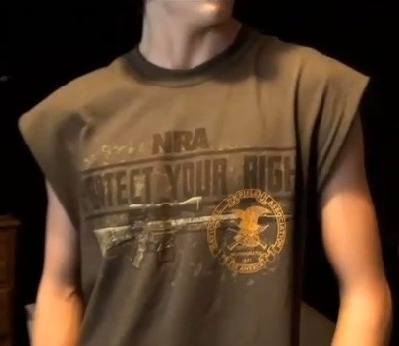 Jared Marcum, a West Virginia 8th grader, showed up at school wearing a t-shirt sporting an NRA logo, a rifle, and the statement “Protect Your Rights”. Fortunately before the shirt injured anyone he was confronted by a teacher, who, though the school dress code did not prohibit the message on the shirt, told him to take it off. I’d like to thank the middle school teacher for boldly enforcing a personal opinion about the NRA, guns, and the vileness of the 2nd amendment despite a clear lack of any rule on the books authorizing ’em to do so. It takes a gutsy teacher to enforce edicts the school board just hasn’t had the wisdom to create. Very pro-active. Clearly the child’s parents are the ones that failed. They never told the child that the 2nd amendment is evil and the NRA is secretly a hate group bent on arming terrorists. We all owe the teacher a word of thanks for filling the void and attempting to properly indoctrinate the child into the current prevailing wisdom. Hopefully alert CPS workers will soon show up to remove this boy from an unhealthy environment where people believe the constitution is worth defending and children are not responsible for following non-existent rules. On a personal note, I’d also like to point out that it is just sick that all you right wing nutjobs are so insensitive to the death of millions who have been slaughtered by images of guns on t-shirts. Oh where is your humanity? Have you NO common sense? Previous Post Treat Tsarnaev as an Enemy Combatant? Of course, no sort of “corrective action” against the teacher, the school or the district will be forthcoming. And the policies will immediately be rewritten to prohibit any sort of images or slogans that might be considered “controversial”… all to PROTECT the children, of course. Kinda surprising to see something like this come out of West Virginia, where folks from 7 to 70 compete in Fourth of July turkey shoots every year. Have to wonder if this teacher wasn’t imported from some ultra-liberal area (the Bay Area comes to mind). Zero-tolerance is more often than not, stupid enough, without leaving such things to the discretion of individuals that obviously have limited thinking ability. Maybe the coming lawsuit will wake a few people up. I hope the family’s lawyer manages to get the arrest expunged, rather than just having the charges dropped. The breathtakingly self-righteous PC sunsabitches have got to be the most clueless form of life on the planet. Rob, I felt it would be helpful to tell you that I have placed my NRA hat, T-Shirt, and all my gun magazines in a steel cabinet under lock and key so that none of these items kill an innocent bystander. That’s thoughtful of you wendell. Just can’t be too careful these days.